When the first trailers for The Imitation Game surfaced, I - along with just about everyone I know - got very excited. What was promised was a gripping tale about the man who invented the machine that would break the German codes and turn the tide of the Second World War in the Allies' favour. It also promised to tell the story of the man himself, and not just his achievements. A tale that needed telling. So walking into the cinema I found myself in buoyant mood, high on anticipation and expectation. 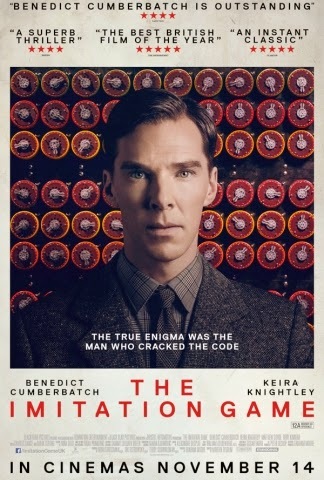 I wasn't expecting to walk out two hours later fuming and angry - and the fact I did is testament to just how good a job Benedict Cumberbatch (as Turing) and director Morten Tyldum did in bringing this odd-ball maths genius to the screen. But I'll get to the anger later. Let's start with the good stuff. Told in flashback during police interview (being gay wasn't just frowned upon in the 1950s, it was a crime), Turing takes us from the events that undid him to the events that made him. Bullied at school ("mother always says I'm an odd duck"), Cumberbatch perfectly captures a man who understands numbers and puzzles but is left baffled by the real world. From his opening exchanges with Charles Dance's Commander Denniston, we can see that Turing's bluntness and superior intellect are not traits that will endear him to many. The fact you not only warm to him but almost fall in love with him shows just how stunning Cumberbatch's performance is. Bouncing between his school days, events at the Manchester police station and the work being undertaken at Bletchley Park, we see our hero through all the highs and lows of his secretive life - culminating in how he solves the biggest puzzle of his life. That's not a spoiler, by the way. If it is, you need to go and read a bit more war history and play less Warcraft. Along the way we meet MI6's Stewart Menzies (the wonderful Mark Strong), Turing's team at Bletchley (Matthew Goode, Allen Leech and Matthew Beard) and the woman without whom none of it would have happened (Keira Knightley in probably the finest performance of career). I say that because while the film is about Turing, and Turing had the ideas that won the war, the real hero is Knightley's Joan Clarke. Without her, Turing can't learn how to actually interact with human beings. And without her the final piece of the puzzle doesn't turn up. And, combined with Cumberbatch's performance, it is through Joan's eyes that we see that Turing can be liked and loved - adding a huge emotional weight to an already thrilling story. Because it really is thrilling. Sometimes, when you already know the outcome of an historical event, you can find yourself sitting back and just watching the story unfold - more interested in the how than the what, if you will. But here Tyldum has measured things perfectly, and you find yourself holding your breath as Turing's machine whirs and cranks for what could be the final time. And you share in the joy and elation of the team when they make the breakthrough - and then fall with them as they realise they have actually created an even bigger problem. The Imitation Game is a near-perfect marriage of direction, acting and storytelling - right down to the subtle colour and tonal shifts to depict the three different eras being recounted. So how, I hear you wonder, can a film that's this damn good (and funny - oh yes, there are laughs to add to the drama, tension and tears) leave one be-hatted critic so angry. There is a point at the end of The Imitation Game where a fact appears on the screen - Alan Turing committed suicide in 1954, at the age of 41 (again, not a spoiler, it's been known for a while). This is followed by the fact he was given a Royal Pardon in 2013, following a conviction for indecency that led to his early death. Now, issues with the fact I'm 41 at the time of writing this aside, look at those dates again. Died in 1954, pardoned in 2013. That's how long it took the British establishment to get round to recognising not only Turing's hero status, but to correct a wrong that should have been averted in 1954. The fact the powers-that-be didn't step in and prevent Turing from being prosecuted just adds further shame on the whole affair. He'd done his job, so they washed their hands of him. Now, chances are, these facts alone would have left me pretty angry anyway, but combined with Cumberbatch's stunningly powerful portrayal of a socially maladjusted maths genius, they added to the feeling that these things happened to someone I had come to really care about. And I can't remember the last time a film made me feel that way.